I saw this idea at Becca's Gallery at Split Coasters and I just loved it. Her work is simply outstanding! 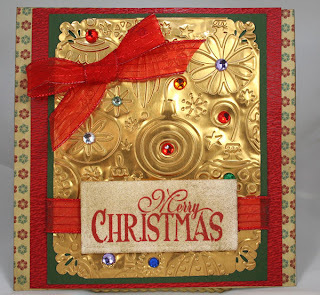 First I embossed a piece of gold metal from Spell Binders with the Christmas Ornaments Embossing Folder from Cuttlebug. Jewels were added, corners punched with Fiscars Victorian Corner Punch and a ribbon strip glued down to hold the Sentiment. I spent a lot of time selecting the right papers, but I finally found this combination and was pleased with the way it turned out. I stamped Merry Christmas from the Ornate Christmas stamp set shown below and then I used my Ink Blender tool to distress it so it blended better with the gold. The printed paper seemed to be just what it needed. A small sheer bow was added for the finishing touch. What a gleaming, beautiful design Joan! I just picked up this folder, but have yet to use it-- thanks for the inspiration! This card is amazing -- I LOVE it!!! That paper is fabulous!! !